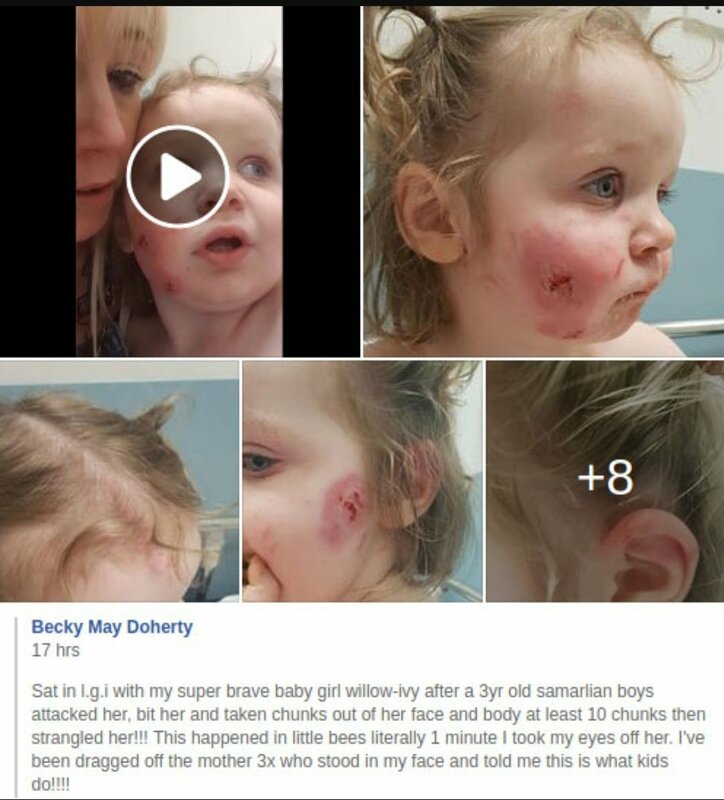 A toddler has been scarred for life after being bitten 15 times by Somali boys who “took at least ten chunks” out of her face and then “strangled” her until she was “blue” — and the media is refusing to report the ethnicity of the attackers. 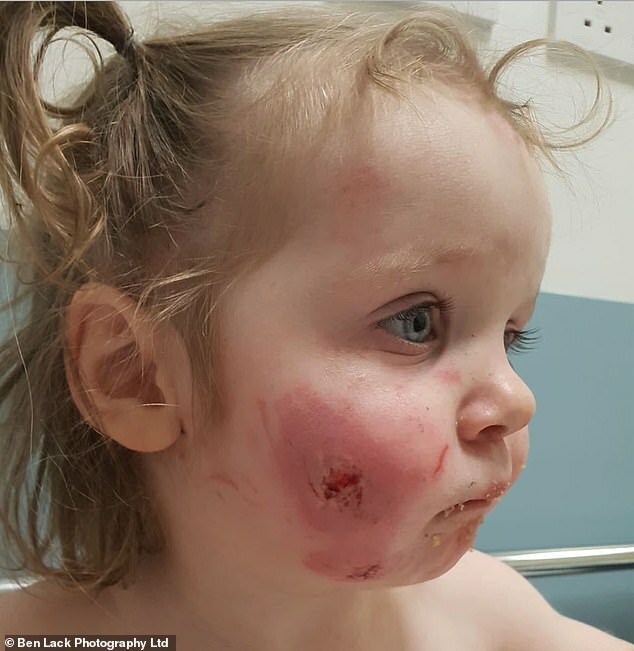 Willow-Ivy Doherty, just 17-months-old, was playing with her 6-year-old brother Tucker, and sister Aurora, 3-years, at Little Bees, a play center in Seacroft, England on November 2 when she was brutally attacked by the Somalian boys. 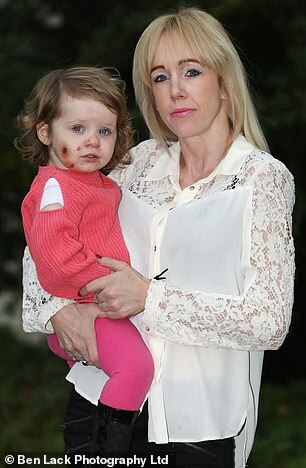 “She looks like she’s been savaged by a dog, not a child,” said Becky May Doherty, mother of young Willow-Ivy. The mother was forced to pull the boy off Willow’s neck and then discovered to her horror that Willow-Ivy had 15 bite marks all over her body. Single mother-of-six Becky claims her daughter was blue after having been “strangled” and the Somali boy who bit her ‘had a big smile on his face and blood all around his mouth’, according to The Mirror. Becky said she believed the boy was 2 and was with a 4-year-old who was apparently his brother. British media refused to identify the attacker’s ethnicity. Here is the mother’s Facebook post. MailOnline reports: Little Willow-Ivy was taken to hospital where she was given an urgent injection for Hepatitis B and treatment for her cuts. She will also require a skin graft on her face. 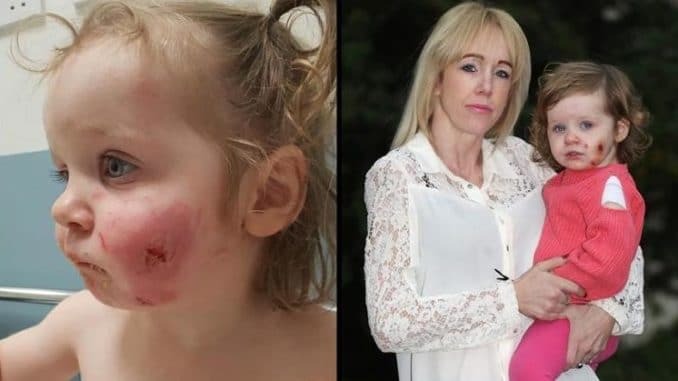 Doctors believe Willow Ivy’s 15 bites came from two different children and have left angry red marks all over her body. The youngster still needs more injections to ensure she has not contracted anything from the bites, which cover her face, back and limbs. In total she has four on her face, two on her fingers, three on her back, one on her ear, shoulder, wrist, leg and others on her head. A West Yorkshire Police spokesman told MailOnline: ‘Police received a report of an 17-month-old child having been bitten by a three-year-old child at an indoor soft play area in Seacroft on Friday (2/11). ‘The child was treated at hospital and an assault occasioning actual bodily harm was recorded.